The FLS range of tie off anchors provide a cost effective solution to fall hazards both in general industry and building maintenance applications. All FLS anchors meet or exceed the industry standard requirements of OSHA and ANSI. As with all tie-off systems a qualified engineers must evaluate the structure to which the anchors attach. 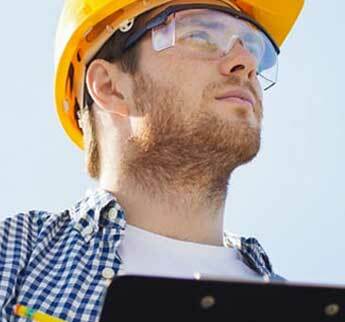 FLS’ engineers can provide a detailed design and analysis to ensure the proper use and installation of all FLS anchor products. FLS single point anchors typically consist of a permanent d-ring attached to nearby structure. 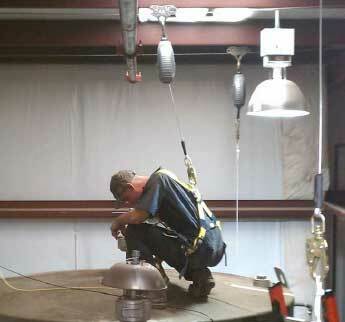 In fall arrest applications the anchors are typically positioned overhead. In fall restraint they can be located at any level as long as the user cannot reach the fall hazard area. FLS offers a full line of building maintenance and façade access solutions to protect workers on swing stages and bosun chairs. 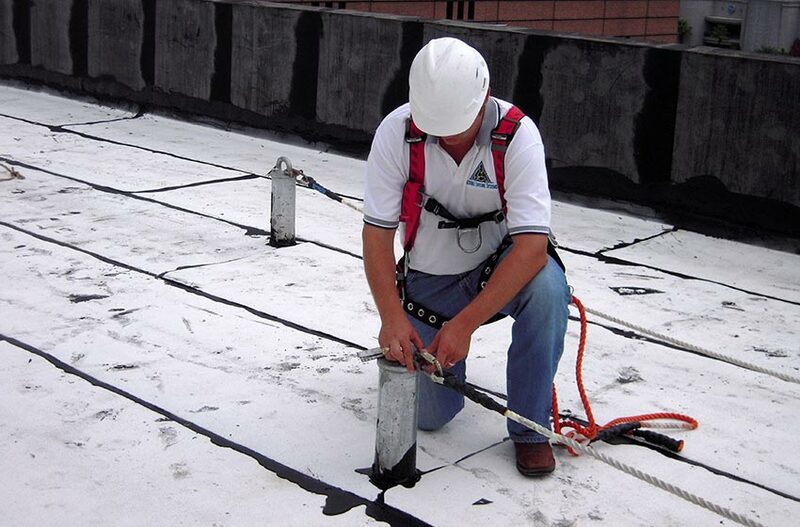 FLS Tieback Anchors are available in standard and custom configuration to work on virtually any roof structure. Our design department can assist you with a layout and configuration to ensure a compliant anchorage system for your building façade access. FLS tank anchors are an innovative solution to a common industry hazard of working on top of above ground storage tanks. These anchors clamp to the center flange of the tank and are available in a wide range of sizes. 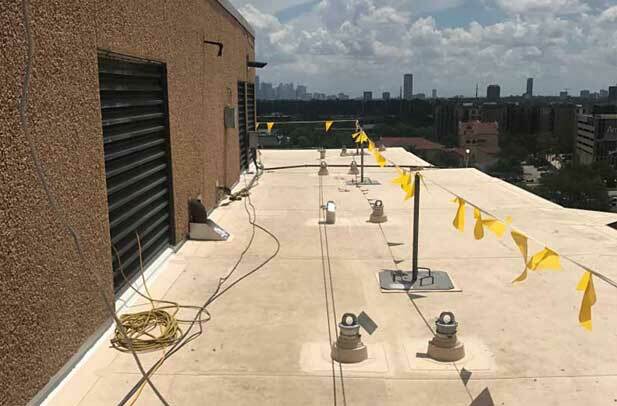 Where work is temporary or a permanent solution is not feasible our freestanding rooftop anchor systems provide a non-penetrating mean of providing fall protection for work on roofs. FLS can manufacturer almost any customer anchor point solution to meet your requirements. 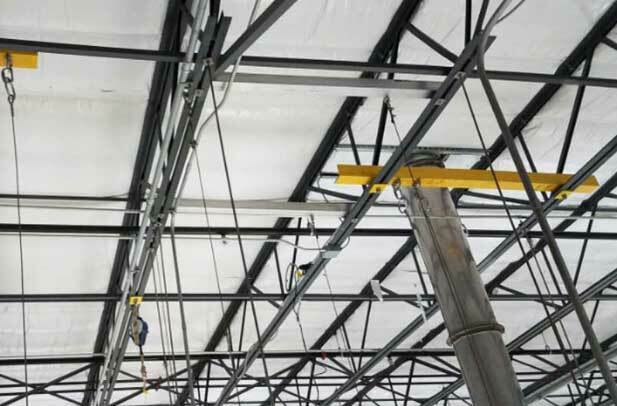 For more information on our engineered fall protection solutions for aircraft hangars and aircraft maintenance, contact our fall safety specialists. 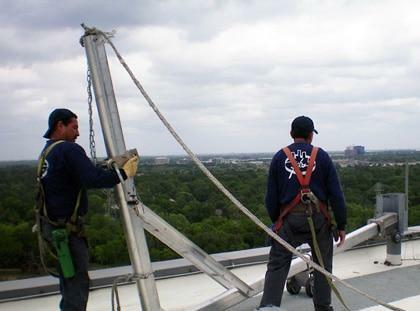 Rooftop tieback anchors were needed to facilitate a window washing system for Texas A&M University. 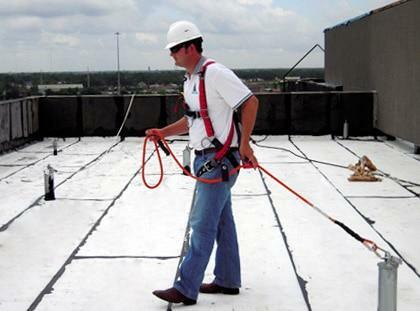 The tieback orientation allows for the worker to connect to an anchor as they enter the unprotected roof area. FLS designed and engineered five single point anchors over the Filler/Capper enclosure. Two single point anchors were outfitted with self retracting lifelines for access to the top of the unit. Two were outfitted with Stainless Steel Cable Drop to access the filler bowl inside of the enclosure. One was outfitted with Stainless Steel Cable Drop to access the Capper inside the enclosure. Flexible Lifeline Systems designed, supplied, and installed 32 Tieback Anchors, one 280 feet Multi Span Lifeline System, and one FlexGuard Portable safety railing. 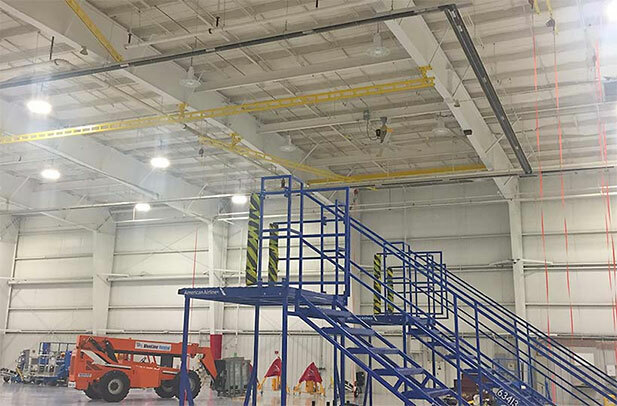 FLS designed compliant and user-friendly fall protection for an American Airlines maintenance hanger while specific clearance requirements. FLS Engineers provided an OSHA compliant system that includes horizontal lifeline systems along with strategically placed tieback anchors to accommodate window washing personnel. Select below for more information about specific FLS anchor safety solutions. FLS permanent single point anchors are a cost effective way to provide point of access fall protection. FLS sockets and davits provide the option of roof-rigged or ground-rigged self-powered platforms with safe access and egress on the roof. FLS rooftop tieback anchors are a safe, practical and permanent anchorage solution for window washing, building maintenance and facade maintenance. 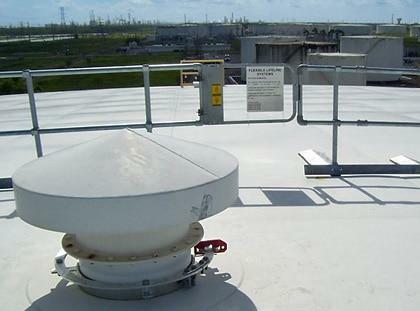 Accessing above ground storage tanks for maintenance, inspection or monitoring can often put employees at risk for falls. 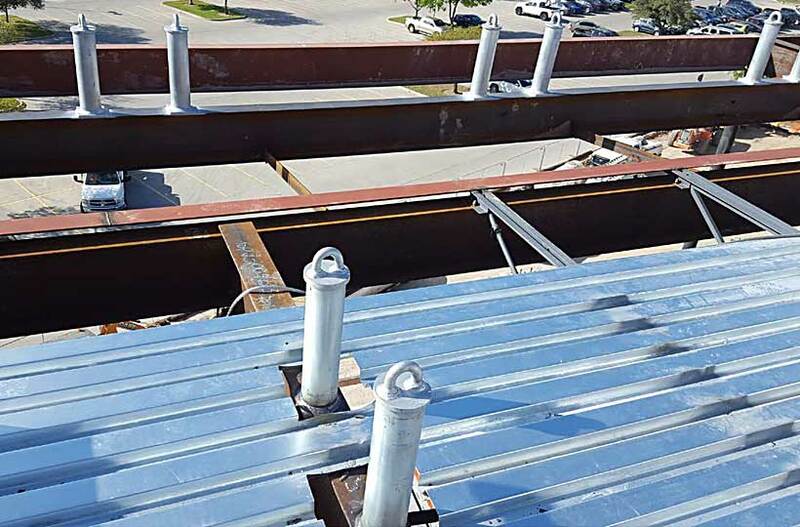 The freestanding rooftop anchor provides worker safety at heights where there is a requirement to access flat roofs or structures. 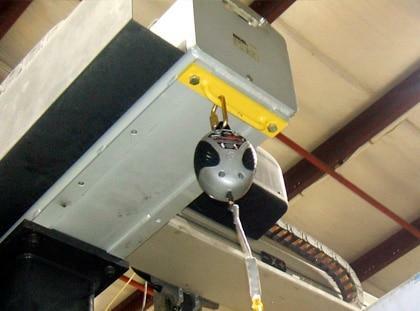 FLS provides 30 day, annual/visual, and 5 year inspections, as well as load testing of building maintenance equipment.